"Smart" contact lenses that measure pressure within the eye and dispense medication accordingly could be made possible using a new material developed by biomedical engineers at UC Davis. 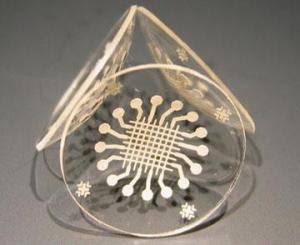 These contact lenses with a pattern of conductive silver wires could be used to measure pressure inside the eye and study glaucoma, a major cause of blindness. A paper describing the fabrication technique was published in the July 2008 issue of the journal Advanced Functional Materials.